Build your relationships and stay connected with your clients and prospects throughout the year with TAX INSIGHT. Each monthly issue contains timely and helpful information that makes sense to your clients. TAX INSIGHT features one or two short informative articles, important tax dates, updates and reminders, as well as fun quotes, historical facts and tidbits. 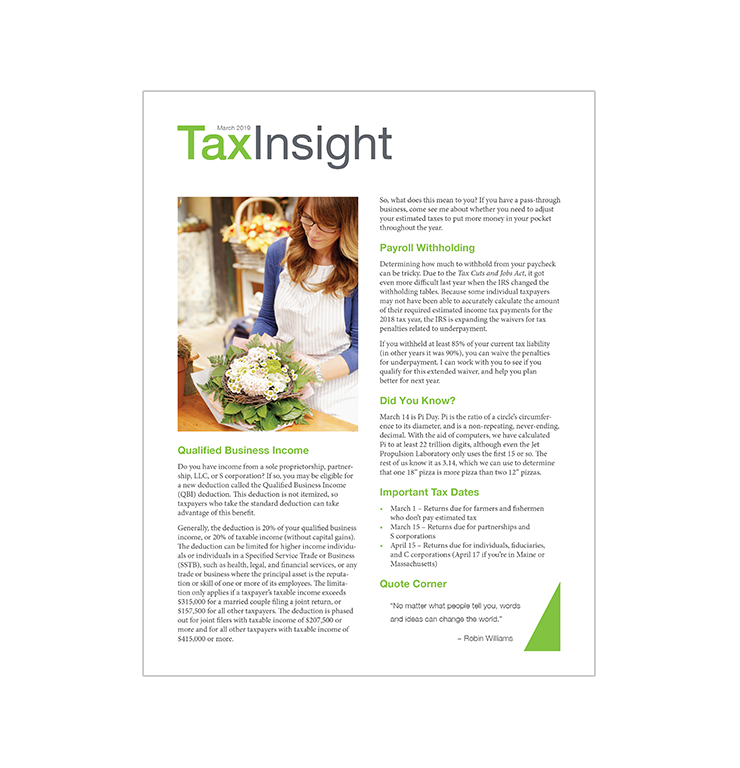 TAX INSIGHT is a single page 8.5” x 11”, full color PDF that you can post to your website, email or print for your clients (a separate rich text file also included.). The PDF is set-up so you can personalize the newsletter by adding your business name and address. At the end of each month, a new PDF will be available for you to download and share for the next month. TAX INSIGHT is sold as an annual subscription with 12 issues beginning January 2019 through December 2019. After your purchase is complete, a newsletter link page can obtain at My Downloads.